Here are your options once your Photomyne subscription or free trial expires. This guide also applies if you had a previous (older) backup plan with Photomyne, that has since expired. 1. Renew your subscription or join Photomyne (formerly ‘Photomyne Cloud’ or ‘Premium’). 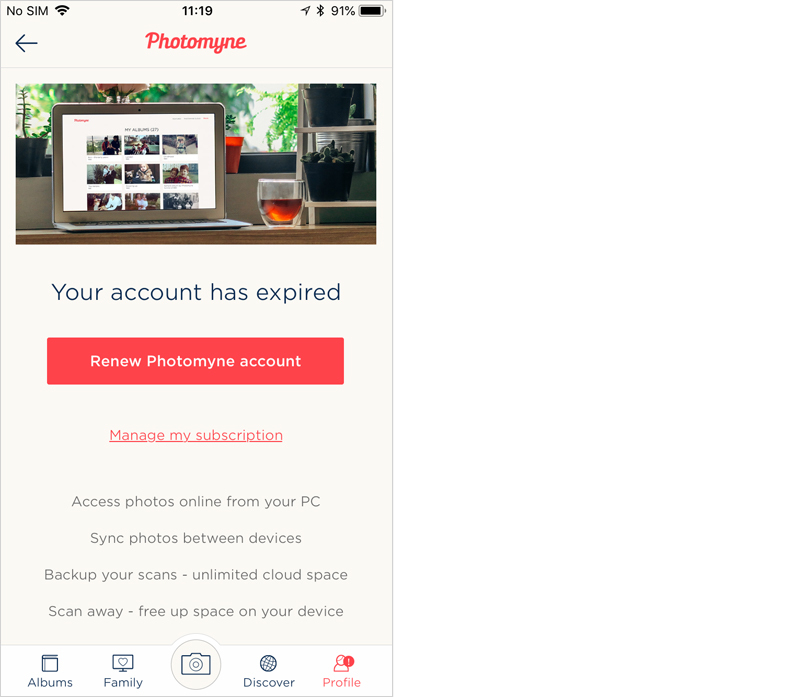 Subscribe to a Photomyne account (recurring billing) for unlimited photo backup, for syncing your account on multiple iOS/Android devices & web access, and to free up space on your device with cloud-only backup. If you had a Photomyne account in the past, the app will show you a special profile badge with will direct you on how to renew. Your photos will be saved locally in the app, on your device. Since photo backup is no longer active, you will no longer have the option to restore your photos in case you log out of the app or switch to a new device. You will not be able to log in to your account on secondary iOS or Android devices (i.e. you could only log in to the app on the first device you downloaded Photomyne’s app on). You will no longer be able to log in to your account on photomyne.com to view your photos online from your computer. Please note: Not having an active Photomyne subscription DOES NOT mean you will lose access to your photos. It means that the photos you scanned will be accessible only on the original device you used to scan them. It also means that, in the absence of an active backup plan, you will lose the photos if you delete the app or switch to a new device. You will still have all of Photomyne’s utility features, including saving photos to your device and creating more albums, even without subscribing to Photomyne. Just keep in mind that all account-related services mentioned above won’t be available in your account. You will always have full control over what happens with your photos. Starting a week before your photo backup plan ends we’ll give you a heads up that it’s about to expire. At any given point you can find out how many days of backup are left (in Account).